In England, as we embark on another academic year with no end in sight to curriculum reform, this particular journey does seem to have gone on for a long time. When grappling with the challenges posed by simultaneous reforms to both A-level and GCSE the demands of the exam can easily become all-consuming, the ultimate goal even. And if the examination becomes the all-important final destination, then many quickly leap to the conclusion that the examination should be used to navigate the route to get there. In England, again and again we have seen this logic manifest in trends in school practices concerning assessment: the use of GCSE summative grade descriptors to monitor attainment at Key Stage 3 (including the formative use of GCSE summative tests), in skills-based progression models derived from GCSE assessment objectives and in the monitoring of progress against projected ‘flight paths’, lines of progress that track back from GCSE grades. We also see it in attempts to make the increased content demands of the GCSE specifications more manageable by beginning courses ever earlier. Before we know it, we find we are, in effect, teaching a five-year GCSE course. It is easy to see the appeal of such an approach: it promises comparability across different subjects and an early training in the ‘skills’ pupils need to be ‘GCSE-ready’. The problem is that it actually does neither of these things. As so many authors in Teaching History have long attested, allowing examination rubrics to dictate the curriculum, pedagogy and assessment simply does not work.1 Grade descriptors and assessment objectives cannot function as models of progression because they are not designed to describe what excellence in the subject discipline looks like, nor how pupils might make progress towards that standard. But elevating the examination to the ultimate goal raises a more fundamental issue. The examination is not the thing itself. The richness and complexity of history cannot be encapsulated in an examination rubric. What do we risk jettisoning if we treat the exam and the subject as though they are one and the same? By doing so, not only do we poorly serve our GCSE students, we risk neglecting our obligation to the many pupils who will never take a GCSE exam in history to ensure that they have a chance to learn history, and not just its proxy, the examination. Fortunately, history teachers are a resilient bunch, as exemplified by the contributors to this edition. In wrestling with the demands of ongoing curriculum reform they all ultimately turn to the thing itself: the discipline of history. James Carroll, Steve Illingworth and Emma Manners explore how to tackle new demands made in revised examination specifications, in both cases finding solutions that lay beyond its immediate requirements. Jim Carroll, dissatisfied with the guidance given by the exam board on historical interpretations, turned to the work of the many history teachers who have theorised its substantive and conceptual demands.2 He builds on this discourse by arguing that historical interpretations are cumulative, being shaped by developments in the intervening period. Carroll thus shows how developing students’ substantive knowledge can support their understanding. Illingworth and Manners demonstrate how a study of a site can be made to serve the GCSE course as a whole. They argue that historic sites offer unique opportunities both to enrich students’ knowledge and equip them with the skills they need to succeed in the exam. In contrast, Anna Aiken’s and Anna Dickson’s concerns lie in how Key Stage 3 can help make students ‘GCSE-ready’. Crucially, they both argue that the solution does not lie in replicating the exam, either in content or assessment. Anna Aiken describes how she sought to tackle deficiencies in pupils’ evidential thinking. Through a process of on-going reflection and adaptation she demonstrates how, over time, better dispositions and habits can be built. Anna Dickson addresses the challenges posed by the increased scope of content in the new GCSE specifications. Dickson shows how an enquiry taught at Key Stage 3 leaves students with a residue of knowledge that supports their learning in subsequent years. 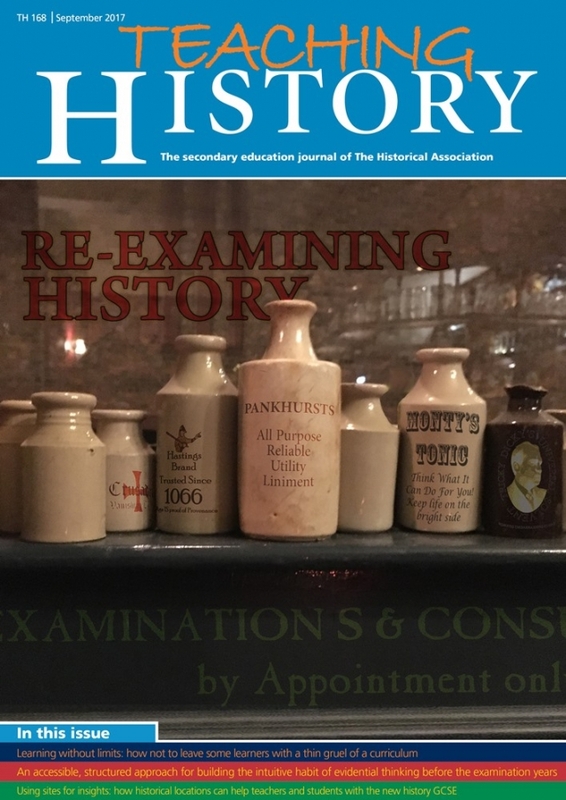 In setting out a rationale for her department’s curriculum planning, Dickson argues that the goals of making pupils ‘GCSE-ready’ and offering a rich and diverse history curriculum are not mutually exclusive. Richard Kerridge, concerned with the effects of ability-labelling on the self-esteem and motivation of pupils deemed ‘low-ability’, also argues that all pupils have an entitlement to a rich history curriculum. By re-examining his approaches to planning and teaching he shows how emphasising both rigour and fun can not only enhance pupils’ enjoyment of the subject, but restore their dignity. Finally, Matt Stanford argues the necessity of thinking more broadly about assessment, both what it is and what it is for. Seeking to improve the reliability and validity of information collected about students, his department set out to develop an end-of-year examination. In describing the process of its design and implementation, he explores wider issues of what and how pupils’ learning in history should be assessed. The theme of this edition of Teaching History is Re-examining History. In some sense, all the contributors are concerned with formal, external examinations and the challenges they pose. In seeking solutions to these challenges however all ultimately engage in an examination of history itself. 1. See for example Fordham, M. (2013) ‘O brave new world, without those levels in’t: where now for Key Stage 3 assessment in history?’ in The Historical Association Curriculum Supplement; Burnham, S. and Brown, G. (2004) ‘Assessment without level descriptions’ in Teaching History, 115, Assessment without Levels? Edition. 2. See in particular Card, J. (2004) ‘Seeing double: how one period visualises another’ in Teaching History, 117, Dealing with Distance Edition.